We have developed Vendor Business Hours add-on that allows you to set the dates and time when the vendor’s store is open and hide their products when their store is closed. — Better customer experience - your customers do not wonder anymore why they have not had an answer from a vendor for a long time. — If a customer follows a link to open the product page of a vendor that is not working at the moment, the product will be shown, but the purchase will be unavailable. — More freedom for your vendors. They can temporarily hide their products from the storefront and search results. — The Back-End Calendar allows the vendor to determine the dates and time when their merchandise is not available in the frontend. — Hide merchandise for a certain period. — More flexibility for you. Working days and days off of your vendors are available on the vendors page. — The admin gets a notification when a vendor is on vacation if the “Notify admin” checkbox is selected. — The admin gets a notification when the vendor is back from vacation and the products become available on the storefront again. The add-on is compatible with CS-Cart and Multi-Vendor 4.3.6 and above. Need compatibility with another CS-Cart version? Contact us. - The functionality that allows keeping vendor products available for sale during non-working hours and on weekends has been added. - "The “Allow sale on weekend” and “Allow sale during non-working hours” settings have been added for the store administrators. These settings enable the store administrator to allow vendors to choose whether to sell during non-working hours and on weekends. - The "Allow sale on weekend:" and "Allow sale during non-working hours:" settings available for vendors have been added. These settings allow vendors to make products available and unavailable for sale during non-working hours and on weekends. 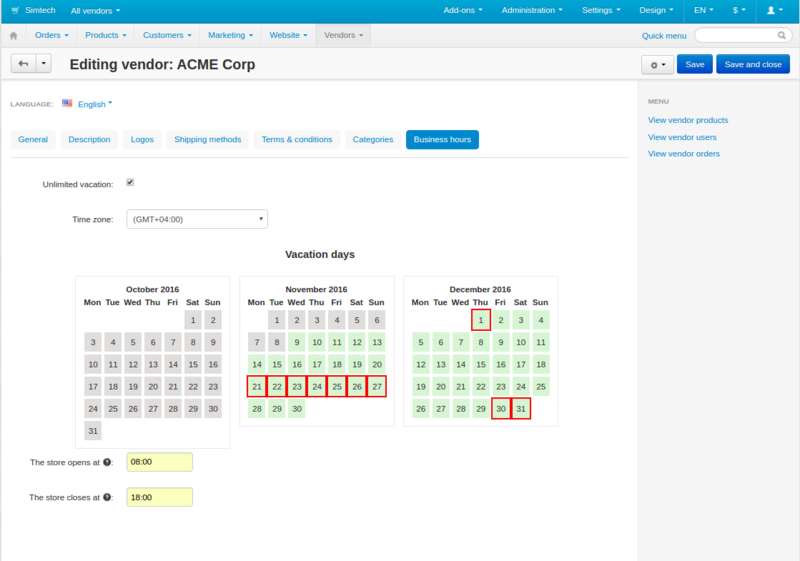 The appearance of the "The seller is on vacation" message window has been improved in our Vendor Business Hours add-on.